Live large with our Luxury Plus SoHo Suite, featuring a spacious design perfect for a couple or the whole family, in Sydney's CBD. 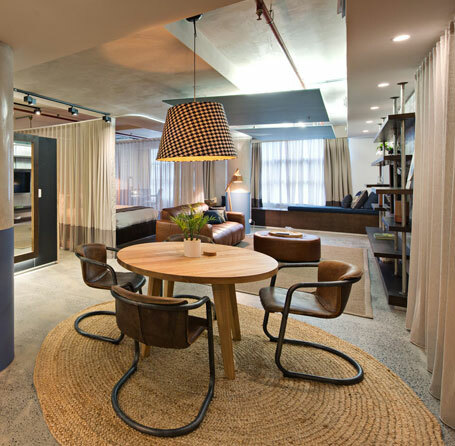 With polished concrete floors softened by natural jute rugs and regional mood lighting, these stunning SoHo Suites are designed in modern industrial-style. Your king size beds are enclosed by handcrafted fabric, helping you relax in pure comfort. There is also an additional double Sofa bed, that can be arranged for extra guests. The Luxury SoHo Suite offers expansive living areas including a leather sofa, large day bed, comfy sofa bed and hanging chair. Make yourself at home and enjoy the 50-inch flat-screen TV with cable channels, Netflix and free WiFi.